Despite being the most important stage of any sale, ‘closure’ remains the key weakness of many selling professionals. The final stamp of financial success for you and your business, sales closure phase, involves avoiding these nine mistakes that will stop your efforts from bearing fruits. On the verge of closure? 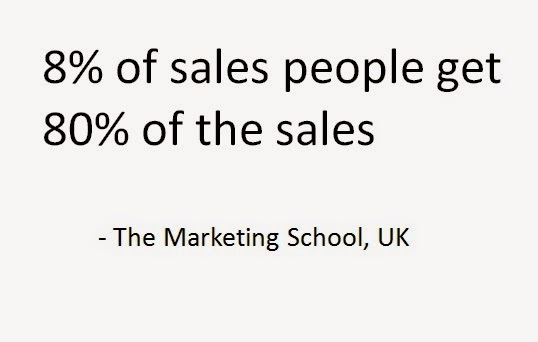 Focus solely on how your product/service will benefit the prospect. Even if you have covered that aspect during the initial stages, it bears no harm in repeating it again here. Many salespeople make the mistake of bragging about their financial strength or the numbers of high profile clients, all of which are irrelevant to the prospect and will only make him wary of engaging you. How would you feel if someone seems to be in a hurry to sell you something? Probably conned. It is the same with your prospects as well. Take your time and make the prospect comfortable in negotiating with you. Trying to push the sale early on will make him/her doubt the credibility of your product/service. The golden rule of physics ‘The harder you push, the more resistance you get’ applies here. Before you close the sale, make sure that you have the right contact person who has the requisite power to take the final call. You don’t want to be in a situation where all your efforts are directed towards the wrong target. Make sure that early on, you are in touch with the decision maker or politely request to be redirected to one. Patience is a good thing, but too much of it during sales negotiations is bad for your business. If you wait too long, you raise the chances of additional issues or concerns being brought up by the prospect that can put a spanner to your otherwise smooth sales cycle. Remember that a fish can slip your bait if you dangle it too long. No prospect likes to be emotionally pressurized into buying. But, too many sales representatives make the mistake of arm twisting prospects with statements like ,” Our usual price is $3000, but if you make the purchase today I can get it for you at $2500”. Apart from appearing pushy, the prospect will feel that he is being forcefully coerced into purchasing your product/service. Instead offer him exclusive offers and make him feel special. Great sales pro will always be on the lookout for signs that the prospect is finally read to invest. He will seize the right moment and ask for the purchase order (PO), thus increasing the chance of conversion. You can employ gained over experience or learned through top sales training books. When you feel the prospect is ready, never waste time by spouting irrelevant small talk and directly request for the PO. Sales people are often in the mistaken belief that marketing collaterals is all that is needed to impress the prospect. Though aesthetic collaterals is important for making a good impression, the sales closure phase will fail unless followed by relevant inter personal business discussions. 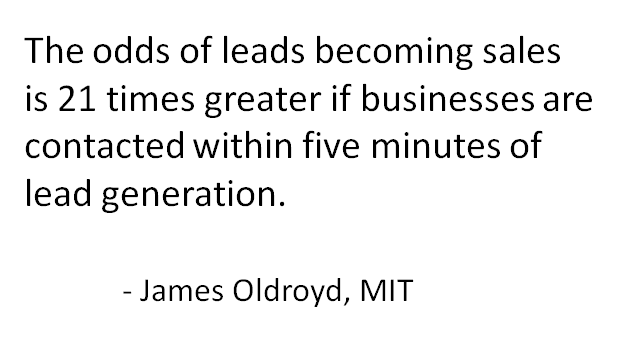 Hence, never overly focus on your collaterals; persuasively and patiently explain why your product/service is best for the prospect’s business. Made a sales closure? Congratulations and start working of after sale service. Never try to sell or give additional information immediately after closing a sale. If you do, the prospect may come across certain features included in your product/service which he may not have needed. It will leave a bad taste in his mouth and may affect your future relationship with him. 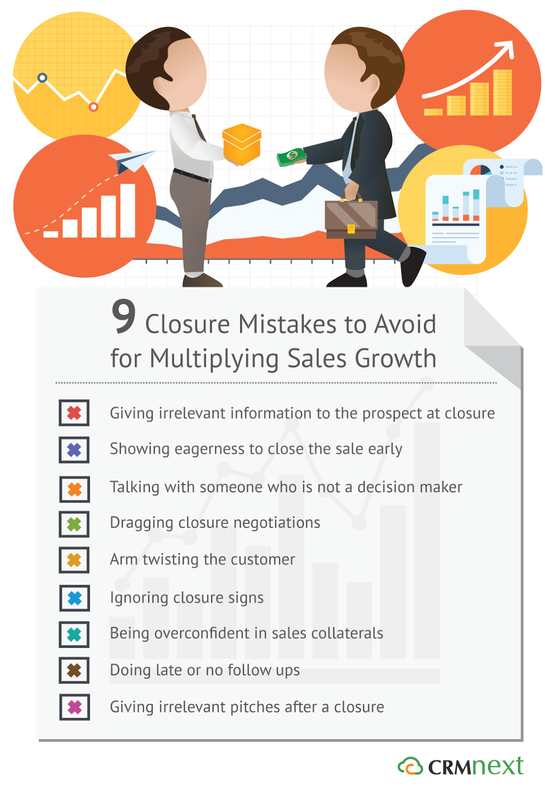 By avoiding these nine sales closure mistakes, you can experience a hassle free sales cycle which brings results to your organization.